Is DC stalling a little lately? Most of the major Rebirth titles are finishing their third arcs. They’re competent, and on occasion, controversial, but we’re kind of waiting for the Doctor Manhattan stuff to get underway and we’ve only got minor clues so far—inching towards solving the mystery, but not really getting there. Maybe “The Button” will be our next big push, but that’s still off a little. So here’s what we’ve got this week. Action Comics #977 (Jurgens/Churchill/Hi-Fi): Read before Supergirl. This is a recovery issue from “Superman Reborn,” where Clark has to adjust to the details of his retconned life, so he travels to the Fortress for a refresher of a life he never lived. Superman origin issues are a dime a dozen, but to his credit, Ian Churchill does his best to remix previous elements of the story into something new and familiar at once. There’s tiny details that recall origins past, but still remains fresh. Meanwhile, there’s a side-plot brewing with Superman’s villains, although it’s divorced from the origin and, sadly, breaks it up unnecessarily. Rating: Three and a half capes out of five. Batgirl and the Birds of Prey #9 (Benson/Benson/Antonio/Passalaqua): This issue of Birds of Prey (come on, that’s a misnomer of a title) is considerably more focused, mostly dealing with Black Canary undercover at Blackbird’s metahuman fight club. There’s not much character development for Dinah, but the issue does expand on her powers, which may present some interesting opportunities in the future. Still, if you’re looking for a ladies’ book, this issue mostly does that, until the last page’s inclusion of some guest stars which hopefully doesn’t detract from the girl power. Rating: Three and a half birds out of five. Detective Comics #954 (Tynion/Takara/Maiolo): This feels like the weakest issue of the current run of Detective to date, which is doubly problematic since it’s been a good series since the Rebirth relaunch. For one, it’s very-Batman centric, focusing on his fight with Ra’s Al Ghul beneath the cave and a dramatic trap left for Bruce. That’s fine, but Detective has done a good job sharing the spotlight with Batman’s supporting cast, and they’re completely absent here. Two, the art is functional, but not great: Takara over-relies on inks on top of his pencils. The basic structure of each scene is present and would probably look fine on its own, but it’s so darkened at times that it’s distracting in comparison to art past. We do get some classic Ra’s dickery here—why does Batman put up with him? Rating: Two bats out of five. The Flash #20 (Williamson/Googe/Plascencia): A good comic has the occasional issue which furthers the story while focusing on a supporting cast member, and this issue of The Flash is a decent example of how to do that. Iris is investigating the mysterious deaths of several speedsters and the disappearance of their bodies, and she goes into deep cover at S.T.A.R. Labs to find the answer. In doing so, she learns some disturbing information about the speed force project—and in the process, a dirty fact about Barry. This is how you do a one-and-done issue and makes for a nice transitional issue. Rating: Four lightning bolts out of five. Hal Jordan and the Green Lantern Corps #18 (Venditti/Marion/Vines/Ribeiro): Green Lantern as a metaphor for racial integration? It happens in this issue, with the Greens and the Yellows having to learn to work in partnership and it going very uneasily. The story doesn’t get too deep into the clash of cultures beyond acknowledging it, fixing it, and moving on to a larger story that may impress 52 fans. They could have done more with the integration thing, but…oh well, at least this issue had a talking gorilla. Rating: Four rings out of five. Justice League America #4 (Orlando/Reis/Hanna/Prado/Maiolo): The initial arc wraps up with Orlando’s thesis on this Justice League explained. This odd conglomerate of Batman, Canary, the Ray, and, uh, Lobo…is less of an interventionist Justice League and more one that empowers people to be their very best. In contrast with Lord Havok’s team which assumes the worst of people and the need for subjugation, Batman believes that people can be elevated to their true human potential. It’s a unique spin, although one issue: every Legauer’s “you can do it!” attitude bleeds together, and there isn’t much that keeps the individual members distinct. Except for Lobo, who still feels out of place. Rating: Three leagues out of five. New Super Man #10 (Yang/Bogdanovic/Glapion/Spicer): I’m going to be honest: I have no idea what happened in this issue. There’s a jumble of demons and magic rings and Chinese mysticism and it all moves so quickly that it was hard to follow. There’s some nuggets of good storytelling in here, though, with Kenan getting a direct lesson in Supermanning from the original and some realizations on how he needs to grow as an individual. And while Kenan may be in Superman’s shadow, we’re learning that Superman isn’t just a person who’s imitated, but a station to which he aspires. Rating: Two and a half capes out of five. Suicide Squad #15 (Williams/Romita Jr./Barrows/Friend/Ferriera/White/Lucas): Well, that actually didn’t turn out so bad. I’ve been hard on this arc for the Romita Jr. art (which still isn’t great), but Williams brings a surprise wrapup to this story which turns the entire story on its head. The early issues of this arc showcased why the Squad can’t last for long; the conclusion proves that the team needs each other more than we realized. The weakness is that the villains are pretty forgettable, but the last page remedies that nicely. Rating: Three goons out of five. Supergirl #8 (Orlando/Bergara/Atiyeh): This is something of a transitory story which doesn’t offer a lot beyond a lot of quiet moments. Superman comes to town to visit his cousin, and while there’s a nonsensical fight scene with a villain which offers a vague “Rebirth” clue, that’s about it. It’s otherwise Superman and Supergirl meeting again for the first time in the aftermath of “Superman Reborn,” so a warning to the wise—you may want to read this after this month’s issues of Action Comics. Otherwise cute, but a little dull for an issue that’s trying to be meaningful, and it seems to shoehorn Superman into a book that he doesn’t quite feel right in. Rating: Two and a half capes out of five. Titans #10 (Abnett/Booth/Rapmund/Dalhouse): Titans is a wide book, but sometimes it just isn’t very deep. So its prevailing themes of friendship and family continue to shine through: the Titans always win because they’re a team and a family—but it just doesn’t cut very deep at times. This issue is a lot of impressive large-scale fight scenes on Booth’s part, and while they look nice, they also cut the story shorter than it should be. The story does end on a tragic note, adding a member to the team but at a terrible cost…but one which does tie into “Rebirth’s” larger theme of relationships being broken. Is this a stealth nod to the Watchmen story? Time will have to tell. Rating: Two and a half Titans out of five. 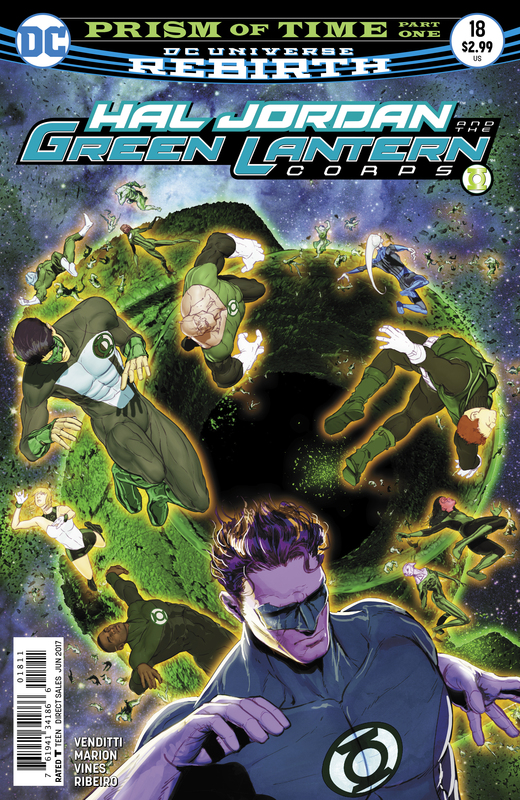 The Winner: I’ll give it to Hal Jordan and the Green Lantern Corps, which does tell a straightforward, well-drawn superhero story without getting ridiculously hammy on the integration concept (it got close, but no). A little more metaphoring for modern America, done right, might have pushed it to a 4 and a half or even a 5. The Loser: Neither Supergirl nor Detective are terrible, but they’re also running a little dry and not pushing as hard as the other books. Detective in particular suffers from running too hard on high-intensity stories and running out of steam. Supergirl has too darned much Superman in it, spoiling a bit of the main Super-books while detracting from the character who actually owns the book. Try harder next time, guys.